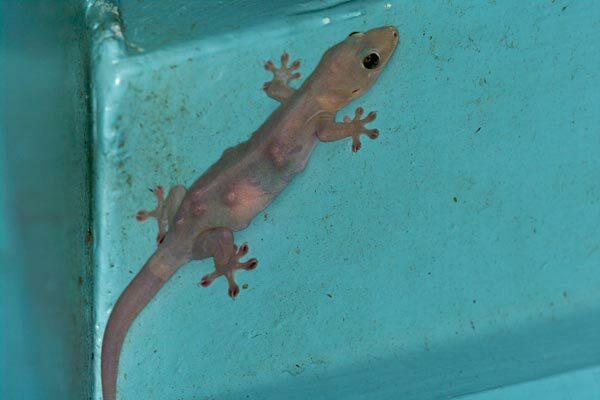 Unlike most of the geckos we saw on buildings on this trip, this one is actually a native species. I dont know what the deal is with all of those ugly lumps. Perhaps they are symptoms of some kind of parasite, or reactions to insect bites. The gecko otherwise seemed fat and healthy, and I would guess that the white area in the belly is an egg waiting to be laid. After ten days or so in which almost the only geckos I had seen were dull little non-native ones. I was all excited when our headlights caught a small gecko on the road at night. I got out of the car and went running over to see what marvelous Australian oddity I might find. I took a quick look at the dull little gecko and thought it was yet another Hemidactylus frenatus. I took a quick handheld photo and ran back to the car to look for something more interesting. 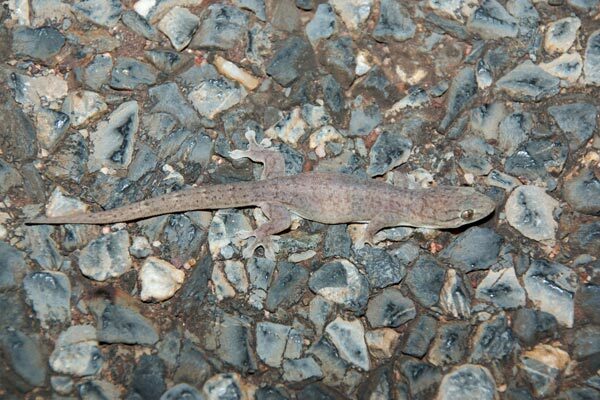 It did occur to me that it was odd to see Hemidactylus frenatus on the ground. But after that I didnt give it another thought until I got home and looked through my photos, and realized that it had been a native species after all.